Hi All! Merci is our Stamp Highlight for today! 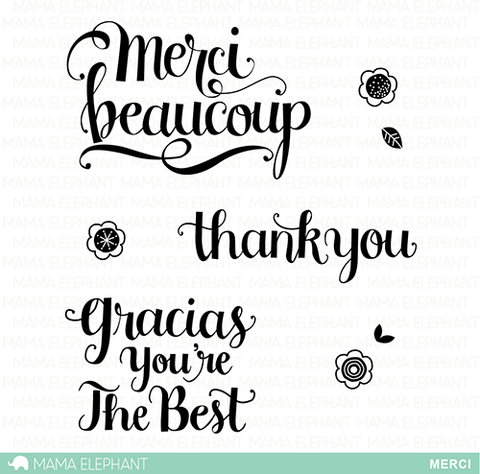 We can never get too much of this beautiful hand lettering by Pauline Ibarra and we can never say too many thanks to all of you! ... and our Design Team? What can I say? They're the Best! Elena put a bit of Spanish flair into her design, with a black, gold and red color scheme. We love it! Laura used her favorite "smooshing" technique to add a loose watercolor background to her card. 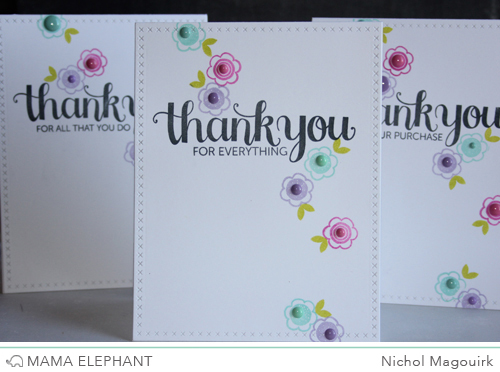 Nichol created a set of thank you cards by combining the sentiment and florals from the Merci Stamp Set with the Many Thanks stamps. The pigment inks stamp the large greetings beautifully! 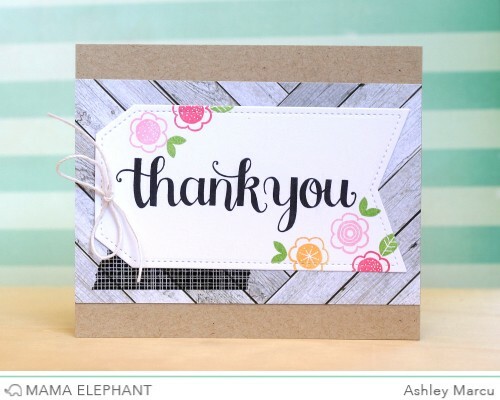 We love Ashley's thank you card and think it would be fun to make several for a special gift. The sentiment takes center stage and the flowers add a fun pop of color! Geralyn created a lovely card using Merci. We love how the bold sentiment stands out from the floral design. Pamela stamped a beautiful border using one of the leaves in sweet lilac, fresh mint, dark storm and moonlight, finished off with a simple sentiment in black. Thanks again for joining us today! We also want to humbly thank you for all the love and support these past 2 weeks and that some restocks should be on the way very soon! Shall we extend (the free gift with your $35 purchase) promotion for a few more days? Love this stamp set, the font is so very beautiful. I would really like to see a Happy Anniversary stamp is this font in the future that would be amazing. Pamela's card is very neat love the design. Great set! I just ordered a few sets can't wait to try your products! I need to get the this set so I can make thank you card for my family and friends back home, with the "Gracias" stamp! Lovey bold writing! Love this stamp set!!! And the sample cards by the DT are absolutely GORGEOUS!!! This set is absolutely gorgeous! LOVE the bold sentiments, especially the "Gracies" sentiment! And everyone's cards are gorgeous! TFS! All those cards are beautiful. I can never have enough Thank you sentiments! 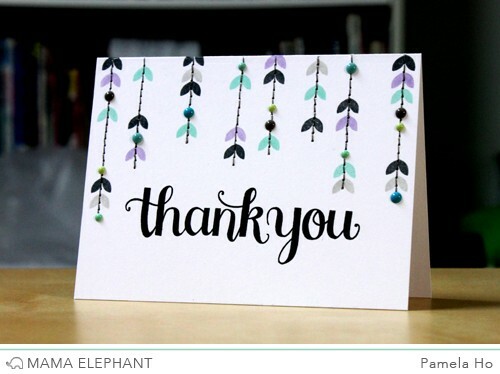 This stamp set stands out so far from all of the rest of the "Thank You" sentiments out there. 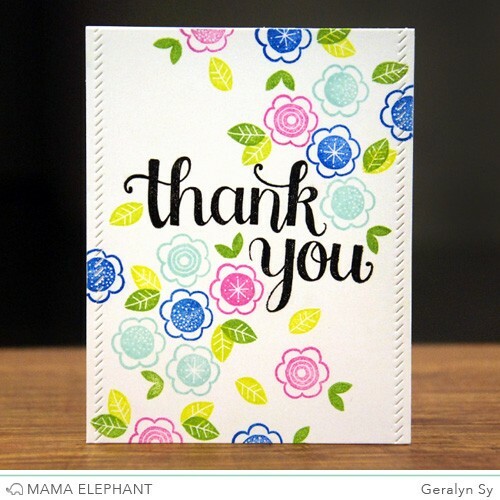 I adore it and can't wait to add it to my growing collection of amazing Mama Elephant stamps and dies! Yes please extend the promotion!!! That would be fabulous! Gorgeous cards. I think I have said it before but I will say it again ME have the most beautiful sentiments with such amazing fonts. The DT cards are fantastic! I've can never have too many thank you cards. Please, please extend the sale, I've been down with the flu & didn't even know about it. I works love to get my hands on sine goodies.